When I got the e-mail from Alex about Dreamcast week I wasn’t quite sure how to feel. On the one hand I do enjoy Sega, obviously, and by association I enjoy the Dreamcast, so I see nothing wrong with a week honouring its legacy. On the other hand I have barely played any games for the system and I have, well, never actually played the system itself. So this week I guess I’ll be writing a tragedy as familiar to us all as Romeo and Juliet was to people in Shakespeare’s day – how it’s freaking impossible to find Dreamcasts or Dreamcast games anywhere. So, let me start by saying that I do actually own a Dreamcast at this time. However, this has only been true for about a month, and I still don’t own any games for it. The only interaction I’ve had with a real Dreamcast has been playing around in the menus, wishing so dearly that I actually had a game to play on it. After setting the time and date I turned off the system, rolled up all the cords and put it back on the shelf, where it still sits. I kicked myself because doing that probably erased the time and date I had just set. When I bought the system I took a look through the games the pawn shop had as well. There were six; three of them were NFL games, two were basketball, and one was baseball. To be fair I had never actually seen any other Dreamcast games in that shop before, so even the sports games were somewhat of a treat. I’ve talked to a few different shop owners about Dreamcasts and Dreamcast games, they all seem to indicate that while the systems sell like hotcakes, the games sit there and rarely get looked at. To me this seems strange, as now that I own a system I could care less about other Dreamcast systems; I want to play games! Well, not the sports games though. I can’t blame the shop owners though; the one I purchased the Dreamcast from is a trustworthy character and always directs me towards his more interesting merchandise when I enter his pawn shop. In fact, it was because of him that I even knew about the Dreamcast he had for sale in the first place. He tells me that in his experience people simply disregard the Dreamcast games he has for sale, so he never sells them. Fair enough I guess. Apparently this brings in money though. Now, while the pawn shops in my city never have these games, apparently ones in larger cities have them all the time. This is all well and good, but I really can’t justify buying a $25 Greyhound ticket to go to an unfamiliar city and a map to walk around all day trying to find stores on the off-chance that they have a game I might be interested in playing. That’s way too much work and way too expensive for something that is only a chance. I don’t drive so I need to take the bus, or have someone else drive me, but then I would have to pay for gas and that would be about the same amount of money. And what if they ended up not having any? It would all be for nothing. I have no idea which pawn shops are most likely to carry Dreamcast games in Toronto and likewise I have no way of finding out. Toronto is a freaking huge city too, so if it’s far from the bus station (and it will be – the bus station is in an area which is mostly restaurants and offices) then I have to either walk or take public transit to this store. This is a problem for someone with no idea how to get around that city. If I do make it to a store which games do you think I’m most likely to find? 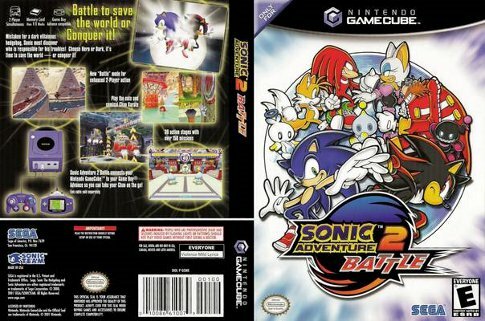 Well, I’ll tell you – ignoring sports games I will find Sonic Adventure and Crazy Taxi. You would think they are the only games that actually exist for the system. Now, it’s not that these games aren’t fun to play or anything; I like both of these games. The issue is that I already own them on something else, or several other things. I’ve played Sonic Adventure on my Gamecube and I have beaten it on my Xbox 360. Likewise I’ve played Crazy Taxi (and those Simpson’s knock-offs) on my Gamecube, PS2, and on my Xbox 360. If I wanted I could play either of those games digitally or in hard copy on the 360. Why would I want to spend even more money on them so I can play they exact same game on a different system? Besides, an arcade near me has a Crazy Taxi machine so I can play that when I want to play Crazy Taxi. What about Skies of Arcadia, Shenmue, Jet Grind Radio, Powerstone, House of the Dead 2? $60, $30, $20, $30-$50, and $30 respectively, plus shipping and handling. That is, depending on the price of whoever is selling it at the time. My only choice for buying the games I want is the Internet, which isn’t the worst thing in the world really, but I don’t have a credit card. My only choice for buying these games becomes buying them through PayPal which takes about two weeks to transfer money to with a bank account. This means I have to keep upwards of $60 on there at any given time just in case I decide one day I want to play a new game. When I can buy a used game for the 360 at the pawn shop for about $20 any time I want, you see why it becomes the more attractive option. Because of that fact I usually end up playing ports of Dreamcast games. Crazy Taxi, Sonic Adventure 1 and 2, Ikaruga, Marvel vs. Capcom 2, House of the Dead 2 – I’ve played ports of all of these games on other systems. Hell, I can play House of the Dead 2 and Crazy Taxi in an arcade if I wanted to. You know something’s wrong if you can find an arcade more easily than an actual copy of the game. Like I said earlier, I’ve never actually played a Dreamcast because the only way I have to play its games is by playing ports of them on other systems. And let’s be honest here, even that isn’t a very reliable way to play. Remember when Sega was going to bring Dreamcast games to XBLA and PSN and then all we got was Sonic Adventure, Crazy Taxi, Space Channel 5: Part 2, and Sega Bass Fishing? Wow, thanks guys, great effort. I heard rumours of something like 14 games that they wanted to bring out before the end of 2010. Well it’s September 2011 and we still haven’t heard anything about the other 10 games – something tells me they aren’t coming. To make things worse I’m the only person I know who owns a Dreamcast so I can’t even borrow games. I’m sure one day I’ll acquire some, but who knows how far away that is? 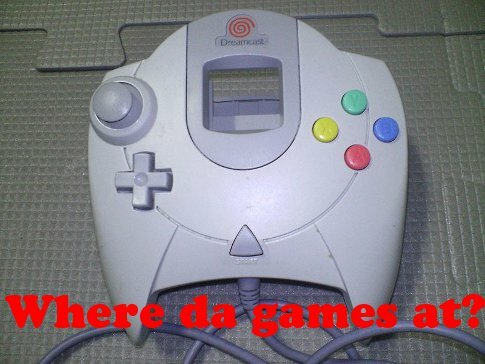 For now this will continue to be the sad reality of the Dreamcast gamer. To be honest all Sega systems seem to have this fate. I’ve never seen a Saturn and Genesis’ are few and far between, though the most common of the three. The Game Gear makes a few appearances, but compared to PSOnes, N64s and Super Nintendos these systems and their games might as well not even exist. Don’t get me wrong, I really like the Dreamcast and I’ve enjoyed the games for it that I have played. I only wish that the games were easier to find so I could play more of them. It’s frustrating to be so close and yet so far from that reality. Also, I better be one of those weird people who likes Shenmue after all this time, otherwise I’ll be pissed! Interesting! I actually got most of my Dreamcast games from local videogame stores (we only have two). This includes Shenmue 1+2, Marvel versus Capcom and Bangai-O to count the more sought after. I always thought the Dreamcast was more popular on the North-American continent than in Europe. Luckily all my DC games were purchased in it’s heyday!